With Valentine’s Day just a few weeks away NOW is the time to start planning your DIY gifts for your special someone, the children in your life, and your BFF. Don’t give in to the temptation to throw money at the gift “problem”. Here’s some DIY herbal gifts that will show your admiration and let your recipients enjoy their good health with gratitude. All while you stick to your financial goals for the year. You can do this. I’ve made it easy for you by breaking down the gifts into what you can make in 5 minutes, 15 minutes, or 3 weeks. The gifts that will take you 3 weeks are gifts that need time to meld. It doesn’t mean 3 weeks of hands on time. Honest. Even the longer to make gifts can be made in less than 1 hour of hands on time. Plus you have the satisfaction of making something beautiful with your own hands. But first some wisdom from C.S. Lewis to set you in the right frame of mind. The whole concept of “love” is transcendent. That makes it elusive to define and to understand. We can surely understand what it is NOT. We’ve all experienced NOT being loved or feeling UN-loved. But understanding what love actually IS goes beyond us. Do you remember the cartoon “Love Is” by Kim Grove Casli (It was a sketch of two mostly naked, vulnerable people, demonstrating kindness toward one another, and then underneath the sketch were words “Love is (blank)”. The comic was popular because it filled that conflict that we all have of trying to define what love is. As if somehow in defining it we could grasp its true meaning. And if we were actually able to grasp its meaning, it might come to us and reside within our hearts forever. The Bible says that “God is love.” That His very nature is love. It suggests that by walking in love and kindness toward God and toward our fellow man, our brothers, our neighbors, even those who hate us, we can transcend the bad things we see in the world. This overcoming evil with good brings light into the dark places. This is the essence of the Gospel message, that God, who is love itself, came down in the form of the Messiah Yeshua (Jesus), to forgive us for our evil deeds, our lies, our hatred, our desire for revenge toward those who have hurt us. And in this forgiveness comes the love that we have yearned for from the day we were conceived in our mother’s wombs. We can express love to each other by kindness. If I tell you, “I love you.” You’d say to me, “Yeah, sure you do. You don’t even know me.” But if I am kind toward you, you will begin to believe it. If I do kind things for you, day in and day out, you’ll either believe I love you or you’ll believe I “owe it to you”. So here’s the first truth. No one is owed kindness. Every act of kindness is a gift. It’s not an exchange. It’s not that I make you dinner so you do the dishes. If that’s the way your household runs, that’s good. But it isn’t necessarily kindness. Why am I saying this? Because too often the kindness in our lives and too often the love is ignored. If we understood the truth that we are not entitled to kindness or love, we’d be happier when we actually received it. Gratitude makes us happy. Every day is a gift. Every kindness is a gift. When we give kindness we are giving a precious gift. This TED talk offers amazing beauty as captured by photographer Louie Schwartzberg. It speaks of the relationship of gratitude to happiness. We can’t give when we are on empty. But we can actually fill up our own “love bucket” through gratitude. Then, when our own love bucket is full, we have kindness to give. So before we go any further and I give you the recipes for these DiY kindness gifts, I’d love it if you scrolled down to the comments and told me how full your love bucket is on a scale of 1 to 5. With 5 being all the way full and 1 being pretty close to empty. And then I’d love it if you told me just 1 thing you are grateful for right now. I’ll wait right here for you…. Great now that you are back, here’s 5 very easy to make, DiY gifts that express Kindness and Love. As you are making up the recipes, be sure to save a few for yourself, too. 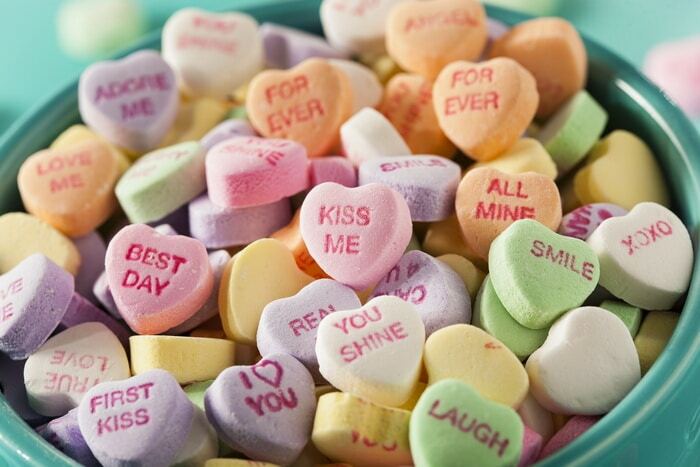 Fill up your love bucket and at least 2 other people’s love buckets with these recipes. 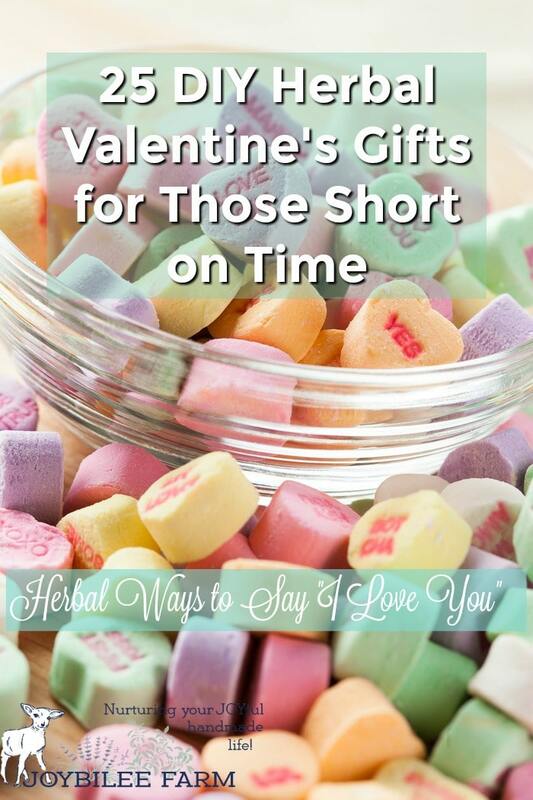 Here are the first 5 herbal recipes for DiY herbal gifts for Valentines, an anniversary, or anytime you need a little more love, or someone else does. You can make all 5 in just an hour or less to show kindness and love to those in your family or for friends. The recipes are easy to double or triple successfully. Sometimes you just need to pamper your hard working hands. 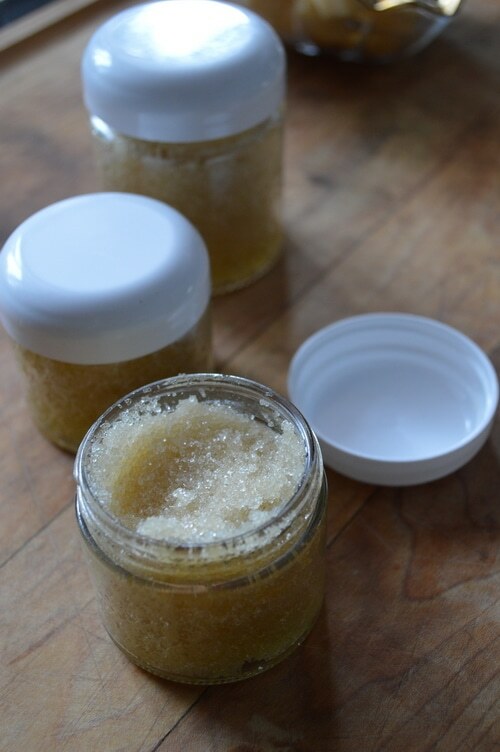 This warming, sugar scrub will soften your skin, exfoliate the dead skin, warm up your circulation, and relax your joints and fingers. It is an act of kindness toward yourself. And you can mix it up in just a couple minutes. 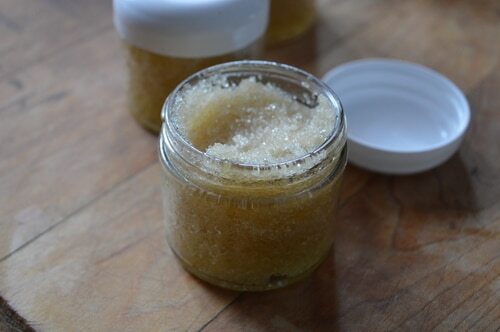 This recipe makes 1 cup of warming sugar scrub, enough for 2 4oz. jars or 4 2 oz. jars. 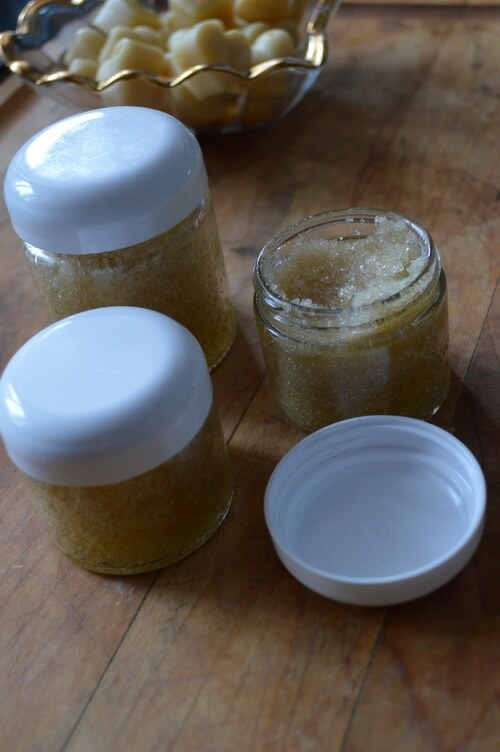 Make one for yourself and another one or two to give away, without doubling the recipe. You can find the calendula infused oil, the rose hydrosol, and the essential oils at Starwest Botanicals and Plant Therapy. In a small bowl. Add the sugar and calendula oil and mix well. Add the rose hydrosol and essential oils. 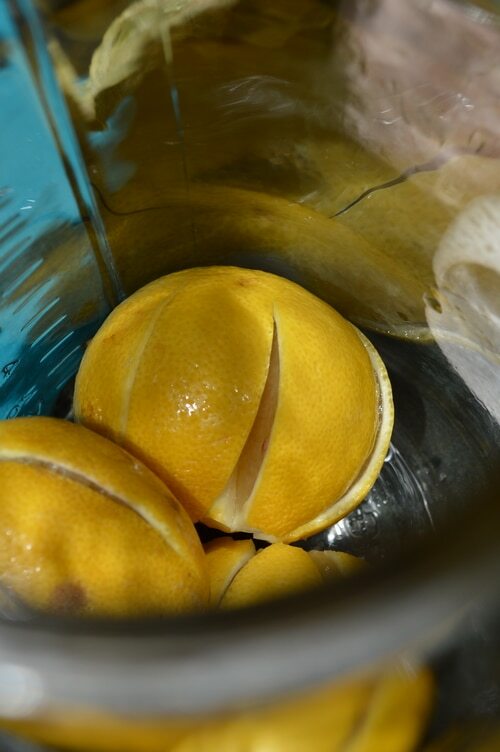 Mix till blended. Store in a glass jar. Take a small hollow handful from the jar and rub it vigorously on hands, feet, or anywhere you need a gentle exfoliating massage. Massage it into your skin, being careful to get it around each joint of your fingers. Rinse with warm water. Pat dry. Be grateful for your hands. This recipe will last about 3 to 6 months. But it mixes up so quickly that you don’t need to make a large amount at one time. Only make what you can comfortably use up or give away within 3 months. If you are using these massage melts on a baby or child, change the essential oils to more calming essential oils like chamomile, or lavender or just leave them out completely. 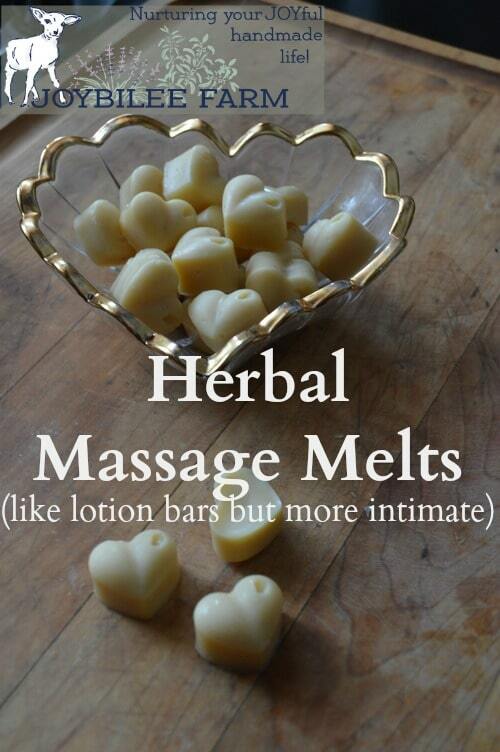 These massage melts dissolve at body temperature. Get the recipe here. 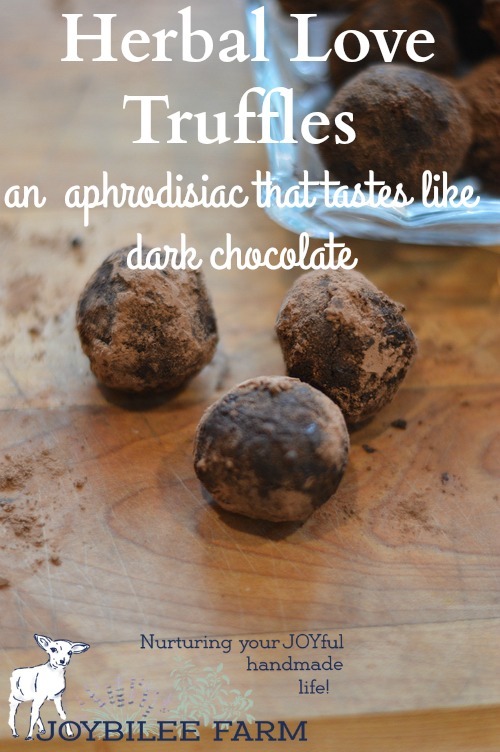 These are chocolate truffles with adaptogen, carminative, and antioxidant herbs to promote relaxation and adrenal health. The recipe makes about 24 1 inch truffles. Sexual health is tied to adrenal health. When the adrenal glands are exhausted, the blood pressure will be out of whack, and the exhaustion and stress of life will interfere with normal sexual drive. The whole organic system is unbalanced. Digestion is incomplete. Sleep is elusive. Adaptogen herbs are tonic herbs that nourish the adrenal glands and help the body cope with stress. Exhaustion takes more than herbs to fix though. 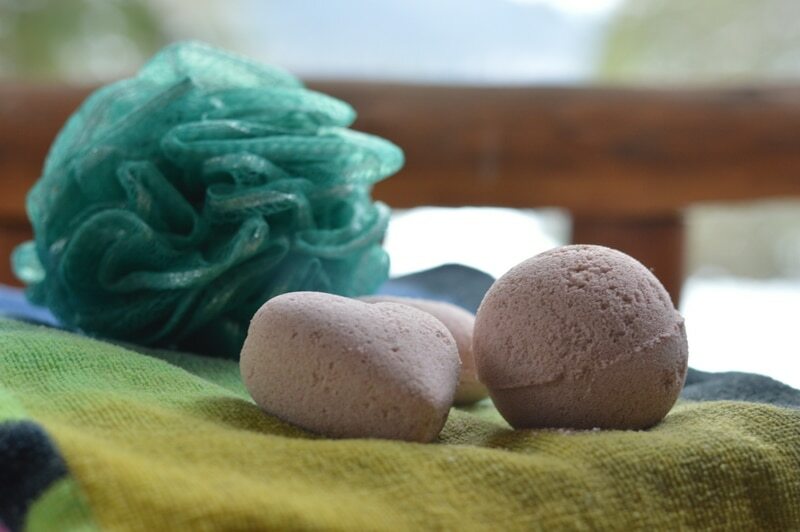 The adrenal glands need quality sleep to replenish, as well, so team up these yummy love truffles with a long soaking bath, a massage, or even a foot massage for deep relaxation. This mildly sweet truffle is tasty, but also tonic. Get the recipe here. Soak away the stresses and tension with a soak in the tub. These herbs are relaxing. 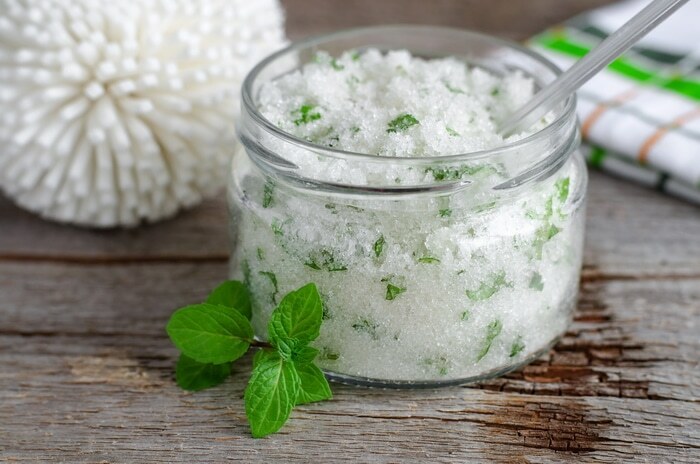 The magnesium in the Dead Sea Salts is easily absorbed and will relieve minor aches and pains. Light a candle. Turn out the lights. Play some soft music to encourage a long soak in the tub. Follow up with a foot massage, or a massage melt for a relaxing and kind evening. 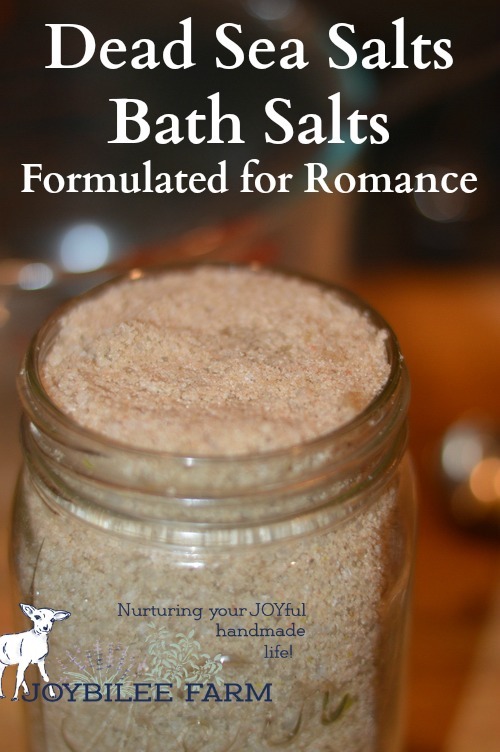 The recipe makes 1 quart of bath salts. For gift giving present it in a wide mouth canning jar with a pretty cloth covered lid. Winter dryness can exacerbate dry skin. A kind touch for brutally sore feet can be all the kindness a person needs. 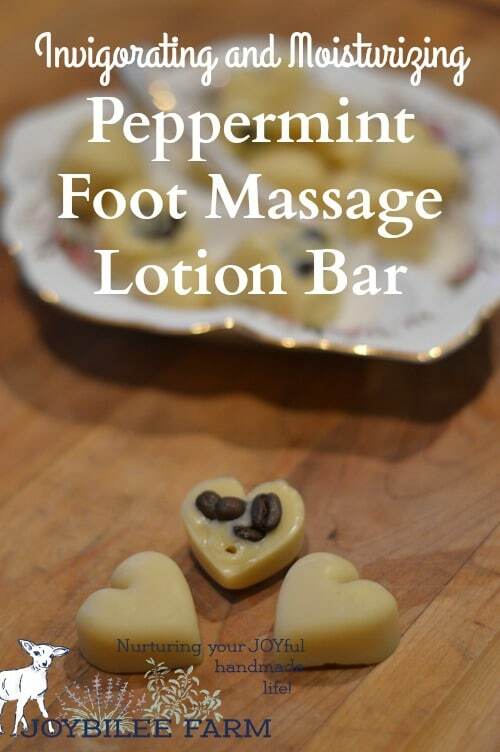 This lotion bar for those sore feet, will invigorate, refresh, and help with fungal issues. This is perfect to followup after a 20 minutes soak in the bath. Be sure the feet are thoroughly dry, even between the toes. Apply the moisturizer, being sure to get into the cracks in the heel, and in-between the toes. This is too stimulating to use for a whole body massage bar, but it’s cooling and soothing for those achy feet. This makes a hard lotion bar. Get the recipe here. 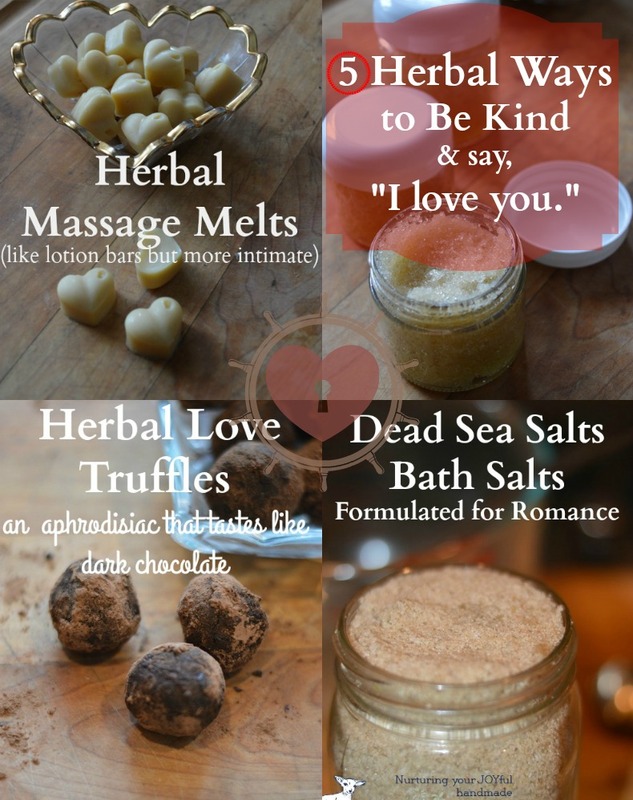 And 20 More DiY Herbal Gifts for Loving Kindness! I divided these final gift ideas based on the amount of time each gift will take you. As you can see, even if you only have 5 minutes of free time and very little money, you can bless a friend with kindness. How cool is that! 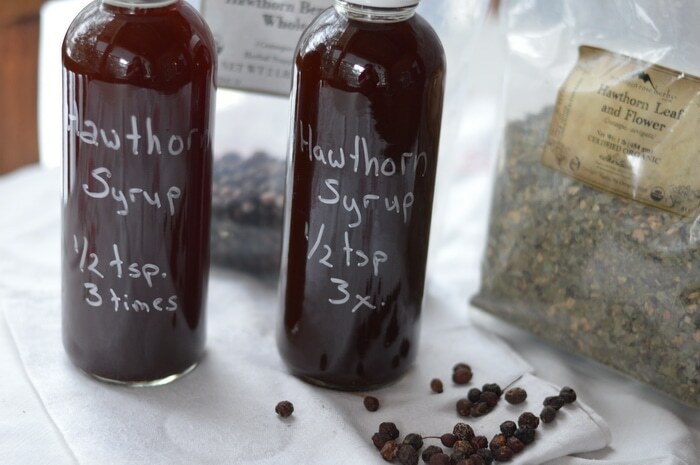 And for the person suffering from the grief of a broken heart Hawthorn Syrup can help start the mending. And it tastes amazing. Grab the directions or recipes for the projects that interest you the most. Order your supplies now and lets DIY some loving kindness to make this world a better place. Thanks so much for these ideas! And for the reminder to tangibly show love to our family.